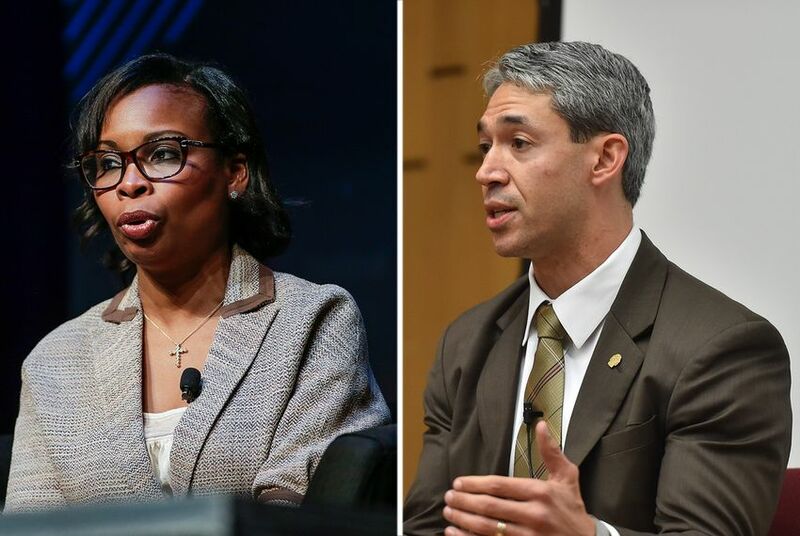 San Antonio Mayor Ivy Taylor will face councilman Ron Nirenberg in a runoff in her reeelection bid. In El Paso, former state Rep. Dee Margo came up short and will face David Saucedo in a mayoral runoff. San Antonio mayor Ivy Taylor will face a runoff in her bid for re-election after earning about 42 percent of the vote in Saturday's elections. City Councilman Ron Nirenberg, who got 37 percent of the vote, ran second and will face her in a runoff. Manuel Medina, running third, conceded Saturday night. In El Paso, former state Rep. Dee Margo finished ahead of six other candidates for mayor with 45 percent of the vote and will face David Saucedo, who got 24 percent, in a runoff. Meanwhile, voters in the Houston Independent School District overwhelmingly approved "Proposition 1," agreeing to pay the state tens of millions of local property tax dollars for use in other school districts, in what is commonly called the state's "Robin Hood" system of school finance. The race for the top post in San Antonio, Texas' second-largest city, is the banner contest in municipal elections that took place all across the state on Saturday. The city of Pasadena held elections for the first time since a federal judge struck down City Council maps as discriminatory, while seven candidates are running for mayor in El Paso. Taylor first was appointed mayor of San Antonio in 2014 after her predecessor, Julián Castro, was appointed to head the U.S. Department of Housing and Urban Development. She initially promised not to run for a full term but did so anyway — narrowly defeating then-state Sen. Leticia Van de Putte in a race that set off some soul-searching among San Antonio Democrats. Her first full term has been generally well-received, but Nirenberg had argued she has not done enough to help the city's reach its full potential. She faced a more strident critic in Medina, the Bexar County Democratic Party chairman, who ran a Donald Trump-like campaign promising to "drain the local swamp." Houston's school tax election was a surprising about-face on an issue presented to voters for the second time. Last November, district residents resoundingly voted against paying more than $100 million to the state for use in property poor school districts, but fears about the consequences prompted school board members to call for another election on the same issue. This time, 84 percent of Houston ISD voters agreed to pay hundreds of millions of dollars to the state over the next few years, but the alternative — having $18 billion stripped from the district's commercial property tax rolls and distributed to poorer districts — might have cost the district even more money. In Pasadena, council member Jeff Wagner has advanced to a runoff in the race for mayor, with 39 percent of the vote so far and more than 90 percent of precincts reporting. Wagner is an ally of former mayor Johnny Isbell. Isbell put forward the plan to redraw the city's council maps, which was struck down as discriminatory by a federal judge in January. Wagner will face San Jacinto College trustee John "JR" Moon, who got 18 percent, in the runoff. Political operatives across the state had their eyes on Pasadena, a voting-rights battleground whose representation has long lagged its majority-Hispanic population. One city council member candidate that the Democratic group Battleground Texas had focused its support on, Steve Halvorson, lost by a razor-thin margin of just eight votes. The other council member supported by the group, Felipe Villareal, got 33 percent of the vote and is headed to a runoff. Patrick Svitek contributed to this story. Disclosure: Dee Margo and Ron Nirenberg have been financial supporters of The Texas Tribune. A complete list of Tribune donors and sponsors can be viewed here.